The Azure Sky RP Community is gearing up for it’s next Tavern Night! Tavern Night is a 1-2 hour biweekly event that centers around welcoming old and new members to the RP community. It works on a rotation, with each participating Guild having the opportunity to host the event at their Tavern, Guild Hall, or Guild Town. While official events take place on a biweekly schedule, any Guild or individual player is free to schedule their own event or Tavern Night on the off weeks. The participants typically meet at one of the major city inns, openly roleplaying with the public for about half an hour. They then have a few dedicated mages portal from the Inn to one of the player-run cities or taverns, where the roleplaying continues until they begin a hunt or light event. The next event will take place on Saturday, March 23rd, at 9pm Eastern Time, beginning at the Helm Inn. 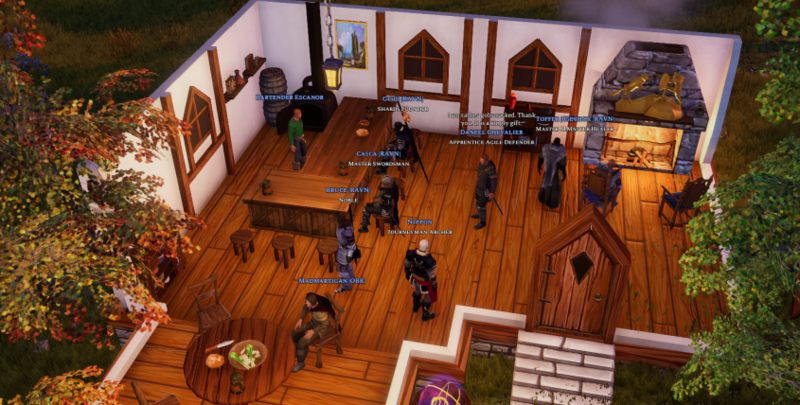 The hosting guild is Band of the Raven, and participants will proceed to “The Ravens Nest” – with portals beginning to appear outside Helm Inn at approximately 9:20pm Eastern Time. According to information on the Azure Sky RP Community Discord – which you can check out here – players are encouraged to stay in character at all times during the event. It’s requested that out of character conversations be taken to Discord or private messages. In addition, combat is restricted to RP purposes, and will need to be discussed prior to the start of the event.